September 19, 1980. That is when September started to be an important month for our family. It’s when my son Dan was born. Then there was the Labor Day Muscular Dystrophy Telethon. I paid attention to it as a teen, I even volunteered when I was about 16 or 17. Then it was a big part of my life and my family’s life for about 20 years. Labor Day followed by the first day of school. And then, September 11, 2001. 30 days has September – and oh they are packed. Emotional, volatile, happy followed by sad. The weight of September is heavy. At times in past years it has been almost unbearable. This year it is about writing. I started the month at a writing conference, my first time speaking at one. This September is about writing. Because Dan was born to write and he expected me to do the same. I let him do the writing and he admonished me for “slacking off” – you see he knew I was a writer too. But he let me communicate with my photography. But he knew I had to write too. 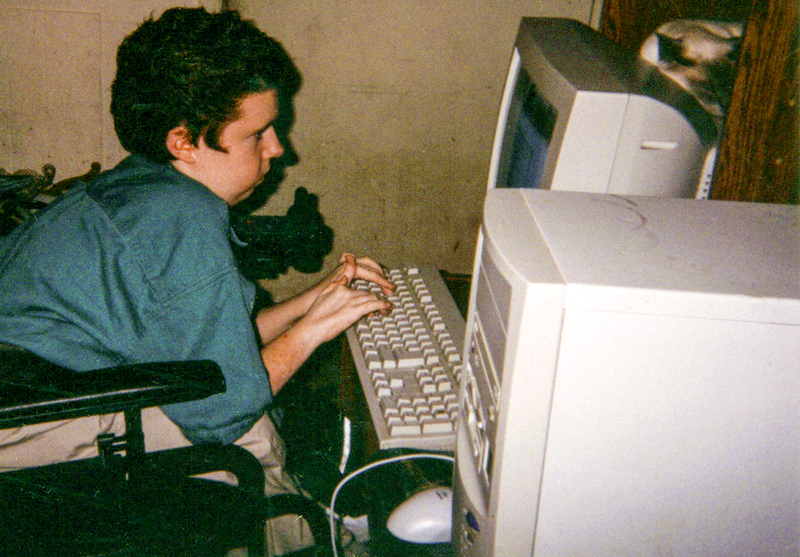 This is a bad scan of a print, but it shows Dan working at his craft, as he did whenever I gave up my computer time so he could have it. He eventually got his own computer, but for many years we shared. And since the internet is all about cats, be sure to notice the Siamese – her name was Henny – sleeping peacefully on the shelf above the monitor. This pic is circa 1998 or 1999.